As web user experience design continues to evolve, we’re seeing lots of innovation geared towards making user experiences more pleasant while also improving engagement and conversions for business. Web development and design is a rich marketplace poised for growth continued into the future as far as we can see. 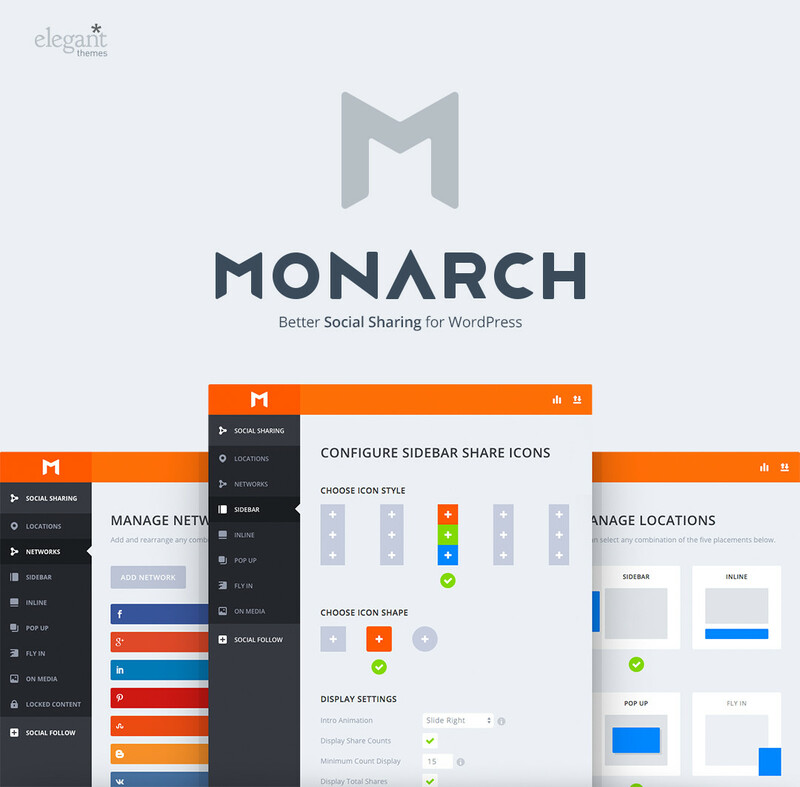 On the heels of that, popular WordPress theme and plugin developer, ElegantThemes, is launching a new social share plugin for WordPress called Monarch, that promises to set a new standard. 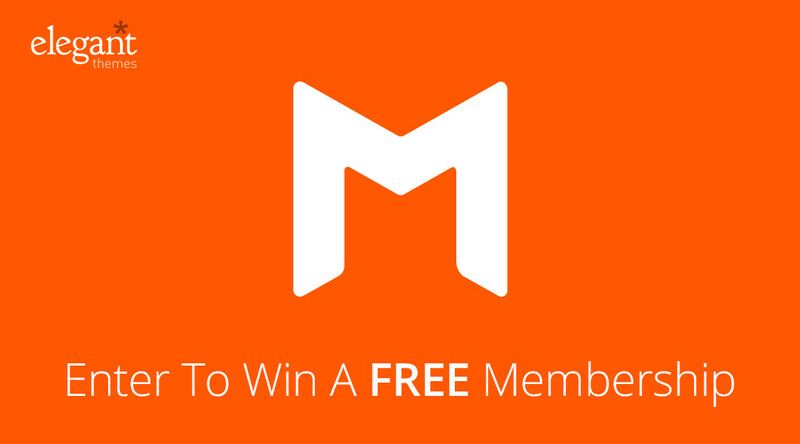 Thankfully, we’ve partnered with them to give away 2 free developer subscriptions for their new plugin! Monarch goes beyond the typical social share plugin that allows users to share content from a sticky sidebar but is specially developed to ensure that wherever your readers are on your page they’ll have a way to share your content. Whether it’s through an inline content block, sticky sidebar, widget areas, smart pop-ups or other forms of integration and locations on your site. It’s a focused approach to conversion. 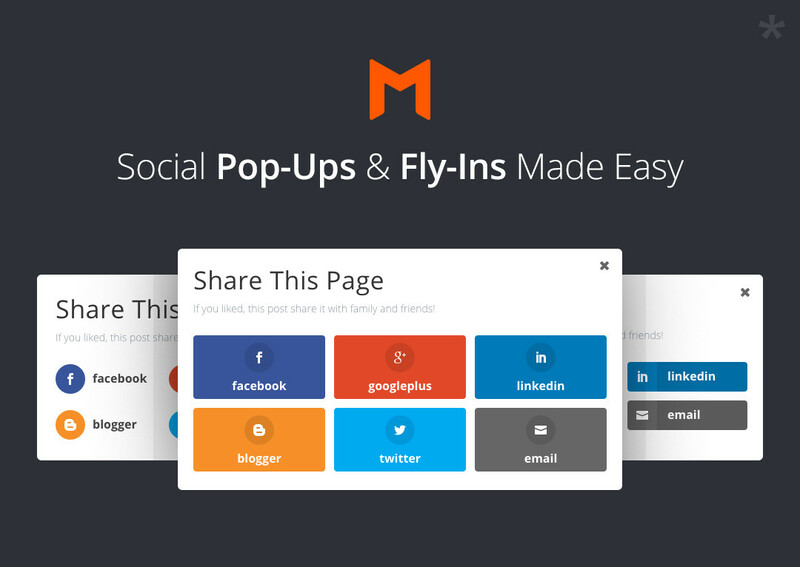 Pop-ups & Fly-in – The plugin’s automatic pop-up and fly-in options are smart and can be triggered based on various users actions such as scrolling, on page exit and time delays that you specify. Very powerful features for customizing the sharing and interaction experience. Floating Sidebar – With unique hover styles, you’ll be able to implement a simple yet effective layout that ensures readers always have access to sharing functions. Image & Video Hover – Images and videos are the most engaging and shared content on the modern web and this option presents sleek sharing options as users mouse hover over images and videos, allowing quick and easy sharing. Here’s a preview of this as well. Above and below content – A standard layout option for content heavy pages with sharing button options before and above or at the end of content. In addition to sharing options, Monarch also allows you to display follower counts from the various social networks you’re connected on with options to also change button sizes, button colors, social icon alignment and orientation, shapes and even insert them in content on the fly using shortcodes. Importantly, the plugin is mobile responsive and lightning fast. User-friendliness extends beyond just sharing options for users but also the plugin promises a seamless experience for developers and webmasters in the setup process. The Monarch dashboard allows simple configuration, addition of new social icons, data exports and imports and analytics to determine how well the plugin is impacting your social media presence. 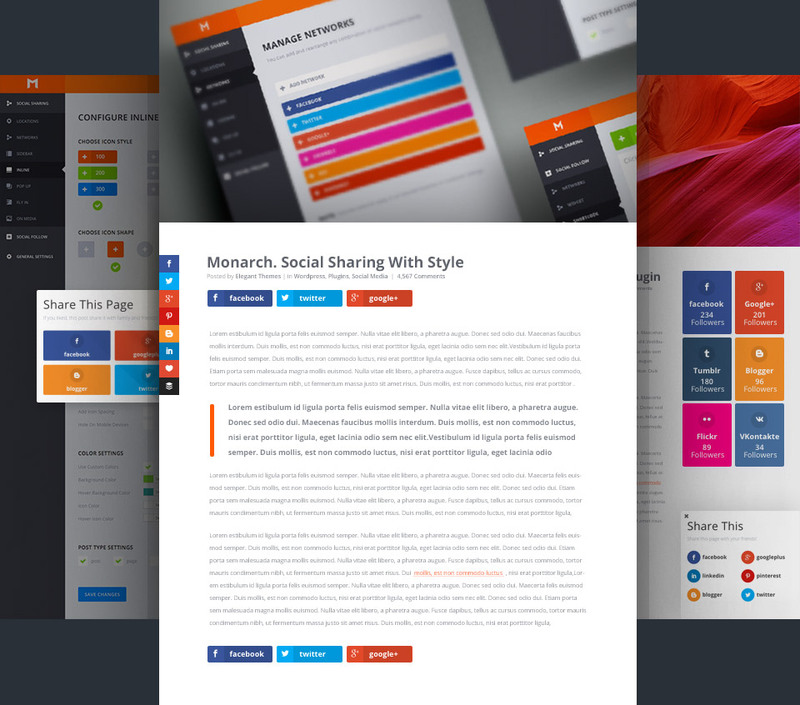 It’s time for a social sharing plugin experience with better design, lightning fast implementation and increased sharing and the new Monarch plugin will help you get the job done. How to Win a Subscription? Simply comment on this article saying, “I want a free sub!” and share the article via Twitter or your favorite social network. We’ll randomly choose a winner from the pool of commentators and notify via email.